IQ Option strives to provide their clients with the best trading experience possible. Not only does IQ Option offer numerous tradable assets and a superb trading platform, but also three different account types to choose from. 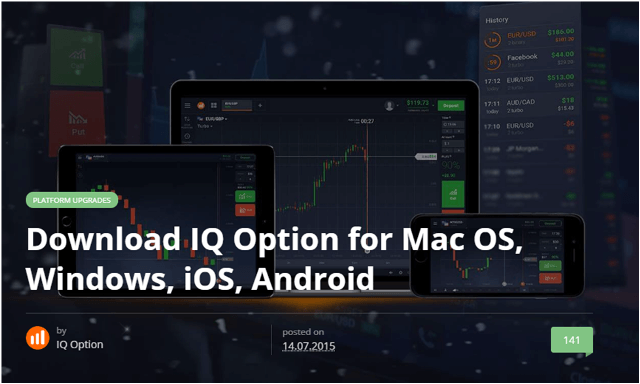 Let’s take a look at what IQ Option has for you! Whether you’re new to trading or just trying out a new trading strategy, an IQ Option practice account is always at your disposal. This demo account is really handy indeed, especially because it has all the features and tradable instruments of an IQ Option real account. WITH AN IQ OPTION DEMO ACCOUNT, YOU CAN TRADE CRYPTOCURRENCIES, CFDS, FOREX PAIRS, DIGITAL OPTIONS, AND BINARY OPTIONS ON ONE SINGLE TRADING PLATFORM! 1 CFDs (stocks) are the exception - all the available stocks are listed here, not only the ones which are currently open for trading. 2 Digital and binary options are only available to non-EU citizens. These numbers change continuously, depending on the time of the day and of the week (which determine which instruments are available for trading). 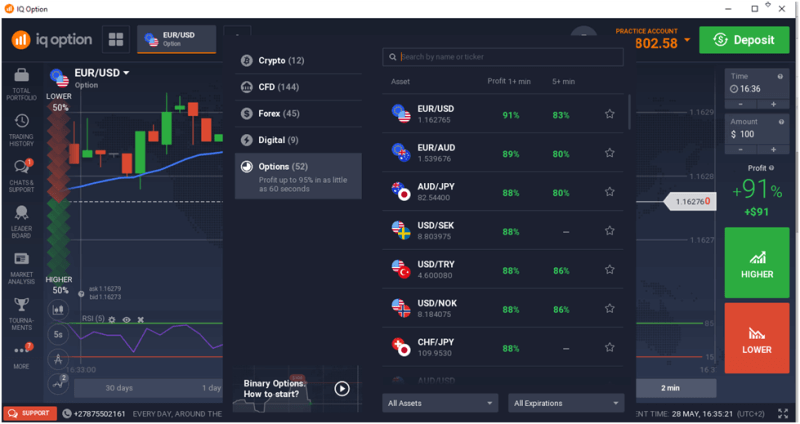 Traders who usually can’t wait for the markets to open on a Monday morning will appreciate IQ Option’s OTC binary and digital options which can be traded over weekends. What a great feature indeed! *OTC options are only available to non-EU citizens. Another convenient feature of an IQ Option practice account, is the ‘top-up’ feature which allows traders to restore their virtual account balance to the original value. In this example, the starting balance was $10,000. By clicking ‘Top Up’, the trader’s virtual account balance will be restored to $10,000 instantly. Traders can also use this same window to effortlessly switch between their real and demo account. * Digital and binary options are only available to non-EU citizens. To get started with an IQ Option real account, the minimum deposit is $10. The minimum trade size is $1 for trading digital and binary options. Forex and CFDs have a minimum investment of $20. Traders with live trading accounts have free access to weekly trading tournaments offered by IQ Option and will also enjoy the 24/7 ‘live chat’ facility if they need support in any matter. * Trading tournaments are only available to non-EU citizens. With IQ Option, profits can easily be withdrawn. Withdrawals are usually completed in one business day and a good variety of funding options are available too. These include e-wallets like Neteller and Skrill, and other methods like Visa, Mastercard, and bank wires. IQ Option’s trading platform can be accessed by anyone with a pc, tablet, or suitable mobile device. This makes it easy to participate in the markets with IQ Option, even for people who are often on the move. TO ACCESS HUNDREDS OF DIFFERENT TRADING INSTRUMENTS HAS NEVER BEEN SO EASY! Personal Account Managers - These are available to assist VIP account holders in different ways and to provide analysis and advice where necessary. Free Participation in Any Tournament - VIP members are able to enter any trading tournament offered by IQ Option for free. Higher Profitability Rates - VIP account holders enjoy higher profitability rates on options. Extra Educational Material - Certain educational materials at IQ Option can only be accessed by VIP members. Personal Tutoring - VIP members receive abundant personal service which includes tutoring. New regulations have been implemented on Binary Options on 2nd July 2018 by IQ Option, and on 1st August they will be implemented on CFDs, as per the norms of the European Union. After the news of ESMA (European Securities and Market Authority) regulations was released, IQ Option started the planning of two separate accounts for the European Union traders—Retail Client Trading Account and Professional Client Trading Account. The professional clients will not be as affected by this regulation, unlike the retail investors. The retail investors have been banned from options trading and will be highly regulated in case of CFD trading. The professional traders will continue to enjoy Binary Options and Digital Options trading, and will be offered a leverage of up to x500. (Terms and Conditions apply) The negative balance protection is applicable for both the accounts. The professional clients will be able to trade Binary Options, Digital Options, Forex, CFDs, crypto, stocks as well as commodities. The professional clients at IQ Option will enjoy the freedom of participating in all the tournaments. The retail clients have been temporarily prohibited in the Union from trading Binary Options as it is often traded speculatively, full of risks and asset-or-nothing policy. Leverage has also been limited as more leverage means taking more risks.